This picture shows my working setup for painting in casein. On the left side are small 1 ounce jars containing premixed paint of casein medium and pigment that I’ve made myself. Each one is labeled with the pigments I use most often, and I’ve glued a small color swatch on them so I can easily spot the colors I reach for. The small squeeze bottle holds casein medium that I’ve also mixed up. My “palette” is on the right side. It’s just a scrap piece of white plastic, roughly 6 x 8 inches, where I place my dabs of paint. The mixing plate is a 12 inch pizza pan. You may notice plastic wrap covering the pan and the palette. That’s Glad’s “Press-N-Seal” plastic wrap. It sticks on one side to just about anything, and the other side has a non-stick pebbled surface. I had been using the pan as a direct mixing surface for a long time before evolving into this plastic wrap system. I used to dab out my paint on the outer rim, much as I do on a wooden palette when oil painting. Typically I dip into the paint dabs for fresh paint with a palette knife or rubber tipped shaper, and mix it on the pan. The mixed paint ranges from dark to light values with different color tones on the outside of it, all blending together. The mixed area will move to an empty spot when I switch to a different base color, such as a red shirt to green grass or whatever. I found that as my mixing area grew it often contaminated my paint dabs, which annoyed me, especially if I was using a wet wash mixture. One particular aspect of casein paint is that it dries rather quickly. It can be re-wetted with water or medium, but that just dilutes the dried paint. I’ve tried “wet palettes” sold for acrylic paint, but they made the paint too watery. Watercolor palettes with their small compartments I found too awkward to use. Instead of liquifying the dried casein, I prefer adding more fresh paint. Physically separating the palette from the mixing area made the mixing process and adding more paint easier for me. With the wrap, clean up is very simple. Just peel it and throw away, or clean and reuse. The paint mixes on this surface rather well when it’s wet, and it’s not slippery like other plastic wraps. I can save the peeled off wrap to record what paints were used in the last session. The palette holds about 12 colors which is plenty for me in one sitting, and I can get about 4 – 5 rows before tossing it. The 12 inch pan has enough space for about 3 different mixing areas, or can be wiped clean with a wet rag. 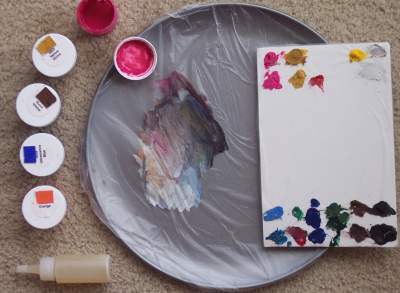 If I’d like something other than the gray color of the pan to mix on, I can place white or colored paper under the wrap. As for the medium, I squirt that into a small watercolor tin, and use as needed. Slightly less than a tablespoon of medium will last for several hours. 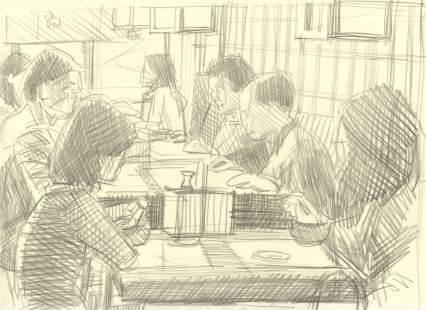 This is an old pencil sketch (roughly 8.5 x 11″) that I made while waiting for appetizers to arrive. The restaurant was in San Francisco, Noe Valley I think, but can’t recall the name. The color test was made digitally later that evening using the Painter program. It’s finally time to make a painting of it. I think now it needs more “weight” space on the bottom. I may either pull back the “camera” view or lower it slightly when I transfer it. Essay: What Would Michelangelo Say? Creating art at a high degree of quality is not an easy thing to do, nor should it be. From my point of view, it is a great challenge. Like a professional athlete who practices everyday, I do not expect to walk on the field and perform at a high level without paying my dues on a regular basis. My most embarrassing moments have come from knowing I could have done better, but (for whatever excuse) I left the failure on the canvas anyway. They are like wounds that won’t heal. If you cannot be certain of your own evaluation, you might imagine some great artist of the past whom you particularly admire were looking down at what you’ve just done. For example, what would Michelangelo say? To be honest, I’m not sure I would want to know his opinion. The measure he would use to evaluate my work would be based on what he thought was great, which would probably just his own stuff. Art has changed very much since then. By that I don’t mean the “anything goes” principle that Modernism allows, but just the strict application of technique and format that he developed, following his own education. I would not discount the work of artists of a different style that came after him as having any less value, although he might. I have no interest in copying the work of someone like Michelangelo, but I do expect it to stand on its own merit. Any art I make should be the best I could have done. The scope of my artwork is also on a much smaller scale, but that doesn’t mean I give my efforts any less attention. If Michelangelo were in my studio, I’d sit him down and say, “Mike, take a look at these art history books, get yourself caught up on what passes these days as Important, and then we’ll talk.” I suspect that, once he got over the impact of seeing a printed page, he’d get about as far as the 18th century and toss the books away in disgust. Can’t say I blame him. So, what exactly would he say? (I’m actually asking you, since I don’t have a clue.) I can certainly imagine it would be a most spirited declaration, but I expect that there would be only so much of it I could apply to my own artistic pursuits. Could Michelangelo appreciate the paintings of, say, Edward Hopper to the same degree that I do? Would he want to go back to being dead? I could try to conjure up a few other ghosts, some more contemporary to at least within the last 100 years or so. There would be several for whom it would pay off tremendously, just because so little is accurately known about how they worked or what they thought about things, but in the end a guy’s got to trust his own judgement. Every artist that we accept as Great, we do so only by consensus of other critics and historians, if not by our own eyes. While it’s certainly important to read their essays on why they have reached such conclusions, they are in the end just someone else’s point of view. Is that what quality is? Fashion? I certainly hope not. Ultimately, I settle on my own ideals. I’ve made a point to be well read and broad minded in terms of accepting what passes as great in the art world these days, but I still have my own standards. I live in this world so I feel I must adapt to it to some degree, despite my best efforts to the contrary. It can’t be avoided. I become inspired each day to make something out of nothing, and how accurately I can match that motivation or personal vision is the gauge I use to measure quality. It’s a personal goal. This painting is almost finished now. There are a few spots here and there that need to be cleaned up. Once again, it’s 12 x 9 inches, casein on panel. These are four fabric samples I recently ordered from Rose Brand, a theatrical supply company. 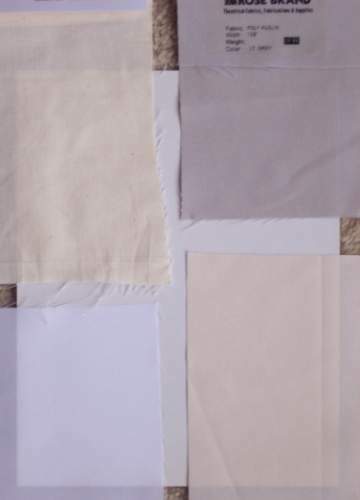 In clockwise order are shown heavyweight cotton muslin, and three different colors of 100% polyester swatches, all about 5 x 9”. Polyester is a more permanent fabric than natural fibers like cotton and more dimensionally stable, but I wanted to test them for painting and how well they adhere to wood. Hopefully there’s enough material here. The first adhesive I tried was PVA on bare plywood (birch.) That wasn’t very successful. Even at full strength, it easily pulled right off. Hide glue or starch paste didn’t work any better, but I expected that. I also tried some acid-free rubber cement, Best-Test White Rubber, which held okay at first, but easily peeled away once it got wet. (To be fair, this glue is mainly designed for paper.) Another glue I had on hand was a double-sided sheet of mounting tape made by Therm-O-Web, which I’ve used in the past for gluing Mylar. It made an extremely good bond at first, but also peeled off easily once it got wet. The last thing I tested was acrylic medium, Golden’s Soft-Gel (gloss,) which held about as strong as the mounting tape after drying for a few hours, and it’s waterproof. The paint medium I wanted to test first was casein, since that’s been my main medium of choice lately. Fortunately, casein seems to adhere just fine to the polyester. The wet washes go down well and even appear to bleed. It behaves just like natural raw canvas. Acrylic paint also sticks well, either wet or thickly applied. 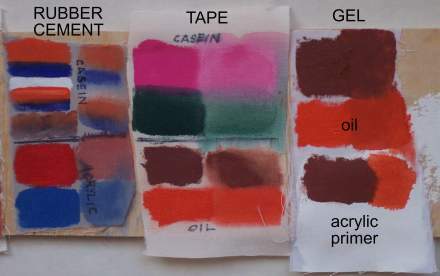 For testing oil paint I used two rather oily brands I had on hand, Sennelier vermilion and Lefranc red ochre. No problems as far as the paint adhesion is concerned, but the solvent (mineral spirits) I thinned them with was even worse on the mounting tape than water. Solvent only slightly weakened the gel at first, but it was fine once the solvent evaporated. So the gel seems to be the winning glue; although, the tape would be okay if I painted the fabric first and then glued it to a board afterwards. Of course, this fabric can also be stretched on a frame, and not glued at all, but I think I would want a heavier weight fabric for that. Acrylic primer adheres well to the polyester. I used Golden’s Acrylic “Gesso” and had no problems. Linseed oil or solvent won’t damage polyester, so there’s no real reason to prime it for oils other than to make it less porous. I would recommend sizing the wood first if you’re using oils and not priming, since the acid in wood might otherwise stain the surface. Personally, I feel that if I’m going to prime the surface then it doesn’t much matter what sort of fabric I use. The main appeal to me for using polyester was not having to make any extra preparations. There’s another vinyl adhesive, called BEVA 371, that might be an improvement also, since it’s reversible, unlike gel or mounting tape, which are permanent. Here’s a new casein painting I’m starting, 12 x 9″. 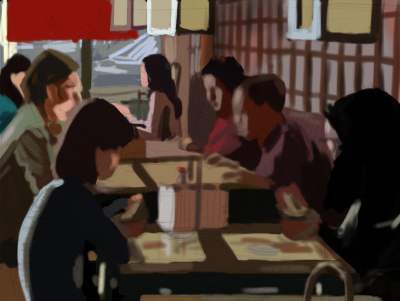 It’s based on a few sketches made while sitting at an outdoor cafe up in Montreal a few years back. 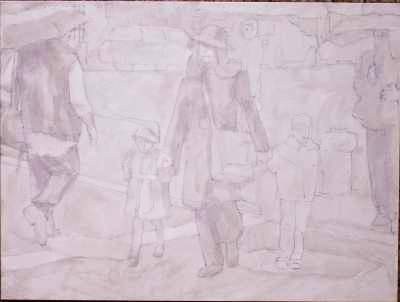 The first image shows the initial line drawing with a gray tone wash, and then some complementary color added. I’ve applied an isolation coat of shellac to this and it’s ready for finishing. I can only make prints up to 8.5 x 11 inches, so if I’m going to transfer a digital drawing to a larger size for a painting, the multiple prints will have to be taped together. I thought I’d share my procedure for doing this for the benefit of those you that may be new to the process. When I’m making a digital drawing, I typically set the image resolution at actual print size (inches.) My pixel-per-inch resolution is usually set at a minimum of 300, since smaller settings can make the lines harder to see clearly. Common monitor resolution is 72 ppi. Under the View setting in Photoshop, display the Grid, turn on Snap, and Snap to grid. Edit the Grid Preferences where the gridlines are every 8 inches and subdivisions are 4. Make a selection that is 4 squares across and five down, which will be 8 x 10 inches. Copy this selection to the clipboard, make a new document, and paste your selection. Select all of this layer, and Stroke the selection. A width of 1 pixel is usually okay for the print with the line location on the inside. You can also alter the line color if you want, which will help you separate it from the rest of the drawing. I sometimes make the stroke in a new layer unto itself, and remove every part of that rectangle except for the four corners, creating a small right-angle mark which is all I need to line up the prints. To do that quickly, select the four corners, invert your selection, and then delete. Now you can print your image. Return to your original drawing and make another selection adjacent to the previous one, being sure to snap to your grid settings. Make another document, paste, stroke, and print it. I use a lightbox to see through the printed sheets of paper, and match up the stroked corner lines, but if it’s daylight outside you can hold them up to a windowpane, and then tape them together. 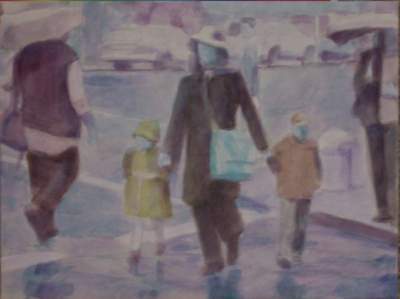 You are currently browsing the Artwork by D. B. Clemons blog archives for August, 2008.